Learn more about integrating supply-side and demand-side interventions to promote youth employment. Many youth employment programs have been implemented worldwide in an effort to integrate youth in the labor market and/or improve the quality of the jobs they have. The impact of these interventions has been somewhat limited. A recent meta-analysis of evaluations of youth-targeted interventions found that only a third of them reported a statistically significant and positive impact on employment outcomes or earnings (Kluve et al. 2016). Part of the problem is that most programs do not affect the processes of job creation or labor productivity growth, often at the core of the youth employment challenges. Going forward, addressing this challenge will require more comprehensive and integrated approaches that focus not only on connecting young people to jobs, but also on promoting the creation of new jobs and improving the quality of existing jobs. S4YE proposes an integrated framework for programs and operations, beginning with a stock-take to identify constraints on the supply- and demand-sides of the youth labor market. 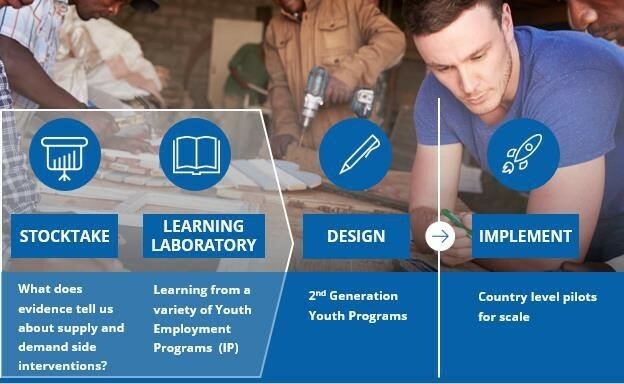 The stock-take will be enhanced by the ongoing collection of lessons and evaluations from youth employment programs, through the Impact Portfolio. These learnings will be used to develop guidelines for a second generation of youth employment programs, programs that integrate both supply-side and demand-side interventions. These guidelines will, in turn, inform the design of a few pilot programs across the world, to be implemented by S4YE.